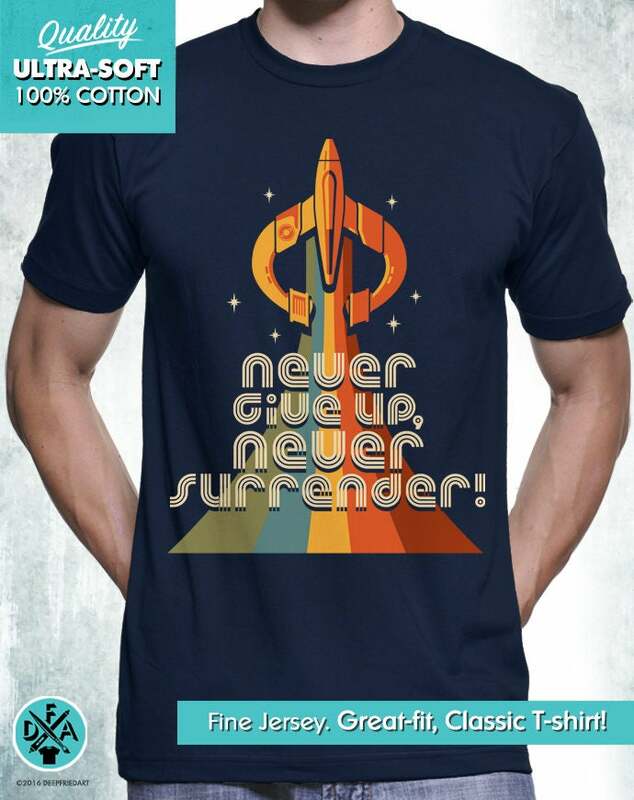 Inspired by the film Galaxy Quest, Never Give Up Never Surrender! Featuring the NSEA Protector. Beautiful retro color and style. 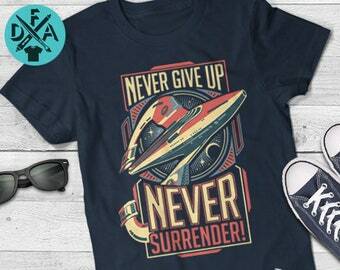 The perfect gift for any sci-fi film or Star Trek fan! Every item is Printed On Demand using the original, high-resolution art files so you get the sharpest and most accurate colors. Quality product printed and shipped in the USA. Designs are printed on American Apparel, District, Next Level or Bella (Ladies) shirts, depending on availability. They are thinner and softer than your regular 100% cotton tee and more durable as well. It also has a higher-end feel and does not shrink as much as your average shirt. Looking for a more heavyweight feel t-shirt? Just send me a note. • Ultra-soft light weight 4.3 oz combed ring-spun 100% cotton. • Pre-shrunk to minimize shrinkage. • Made in the USA, sweatshop-free. • Contoured body for slim, feminine fit - ladies fit runs small, see sizes below. Please allow 3 to 5 business days to print and ship your new t-shirt. Most orders usually ship out 2 or 3 days after ordering, depending on the amount of orders. I will keep you informed if there are any problems or delays with your order. • USPS First Class shipping anywhere in the United States only. • Priority shipping upgrades at additional cost available. All sales are final and will only accept returns on printing errors or incorrect item. I cannot exchange shirts for different sizes so please make sure you are buying the correct size. Please refer to the size guide. If you have a problem with your order as mentioned, please send me a message and I will resolve the problem.